Lady Oliva Fairfax has a terrible secret: five years ago, when she was a mere sixteen years old, she discovered her mother’s body–and a suicide note. Her faith in God shattered, Olivia nevertheless covers up her mother’s act and hides the evidence–all to protect her brother Marcus from scandal and religious disillusionment. Now, she’s paying for her deceit: her despicable neighbor, the dissolute Baron Finley, swears he has the suicide note and will expose the family secret . . . unless Olivia marries him as soon as possible. Meanwhile, Nicholas Stuart, the Marquess of Huntsford, returns to England from a long sojourn in France. As he is Marcus’s best friend, Olivia is unable to avoid the honorable, good, and forgiving man. The situation is made worse because Marcus suspects Baron Finley of having designs on his sister–and engages Nick to help keep Olivia protected at all times. How can Olivia bear to chain herself to a man she detests when she’s falling in love with Nick? How can Nick watch Olivia inexplicably insist on marrying someone so far beneath her? And is it possible for Olivia to regain her faith in God, despite all the horrible things that have happened in her life? I must say upfront that I am an atheist, that if anything I lean towards paganism more than the Christian traditions I was raised with, and that I picked up this book in the library mostly out of morbid curiosity rather than excitement. I had never seen an “Inspirational Historical” romance before. That said, I was pleasantly surprised by Mandy Goff’s book. The fact that it had a Christian agenda actually led to some more interesting characters than your stereotypical Regency has. Gone is the “Reformed Rake” trope–instead, the hero is impeccably pious despite a background that should have made him doubt God. Olivia, on the other hand, has her own struggles. I was relieved to see that Goff did not have all her characters complete believers from the beginning. Instead, Olivia is quite the opposite–and appropriately enough, caught up in webs of deceit that she wove to protect others. Needless to say, The Blackmailed Bride ranks very low on the explicitness scale. However, Olivia and Nick do have good chemistry. I think their relationship will survive, and although I found Nick to be a bit commandeering, I really, really appreciate having a non-rake hero every once and a while. Though Goff makes mince-meat of many of the proprieties of the period, it does lead to some laugh-out-loud comedy. The overly-familiar butler, Gibbons, is a particularly humorous character. Finley is fittingly awful, and not much worse than in a traditional, non-explicitly-Christian Regency. Marcus and Nick are both well-developed (as is Olivia), though as usual most of the plot depends on hot-headed assumptions and misunderstandings that could be cleared up with a simple conversation. As for the Christian message, I think that Goff has done well. 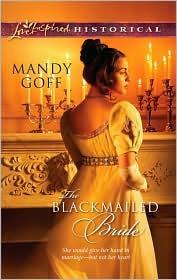 It is clear that she thought out how to weave her lessons into The Blackmailed Bride as subtly as possible. Usually, the religious turning-points are closely tied to the plot, which makes the book less preachy. Though I doubt I will ever be a fan of Inspirational romance novels, this one is a good introduction. Overall, it is not far off from your typical, 1980s or 1990s chaste Regency–but with a little extra God and praying thrown in. I recommend this book highly to those who are looking for historical romance with a religious angle. Previous Previous post: Room…But Not Bored!